Personnellement je préfère dans les tons plus clairs, mais c'est toujours aussi réussi comme réalisation. It's a beautiful pattern. I think you referred to her as Mini-Al! Thank you so much, Astri! I was very excited to find your lovely pattern in my inbox this morning. The pattern looks to be very clear and detailed with lots of photos to explain all the different steps. I am in Australia so it is a bit hot still for crochet at the moment. I am looking forward to making the pattern up soon though! so beautiful!! you used the name Mini-Al :) the beautiful daughter of Al! totally checking out your Etsy... Have a great week Astri!! Congratulations winner #3! You are the 5th to comment but the 3rd to guess the name! Very pretty pattern. I like it in the grey/pastel colors best. Me encanta que lindos colores y el tuyo bien suaves adorables!!! besitos. Mini-Al! (Although I'm outside the limit.) 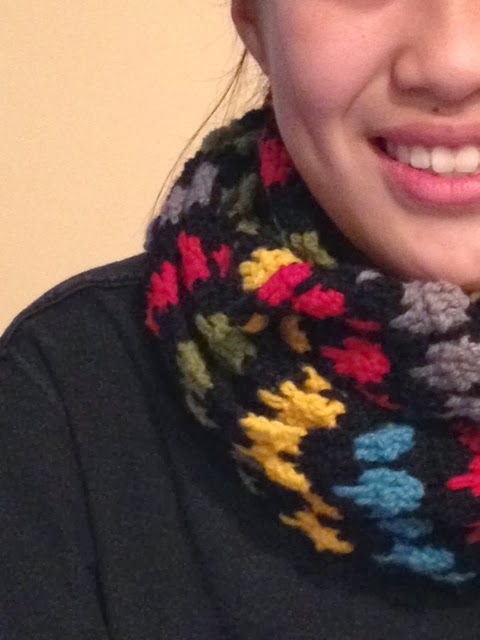 This scarf pattern is lovely! Oh, wow. I love them both. What a lovely scarf. Beautiful scarves, you know I am addicted to gray so the second one makes me swoon. I love this infinity scarf with the black background!